Yoga for real means using yoga in your real life. It's about doing yoga to find more balance anytime, anywhere, in the moments when you need it most. Why wait for the weekend or vacation to Reset when you can do it now, while your real life is happening? The more real you make yoga by integrating it into even the busiest of days, the bigger the impact it will make on how you feel and perform in everything you do. Many of us spend a good portion of our day hunched over a computer screen at our desk. We sit—all the time. We then carry that flopped forward posture with us throughout our day, further amplifying it as we scroll our phones during the commute or while waiting in lines. This stiffens the chest and shoulders (plus the hips), overstretches the back, and puts our core to sleep. Prolonged sitting contributes to back, shoulder, and neck pain, as well as headaches, and the resulting slumped over posture has even been shown to negatively affect our mood, confidence and energy levels. Not to mention you're not doing your body any favors by taking that alignment and tension with you into your workout. Luckily, you can Hit Reset even when you're at work! 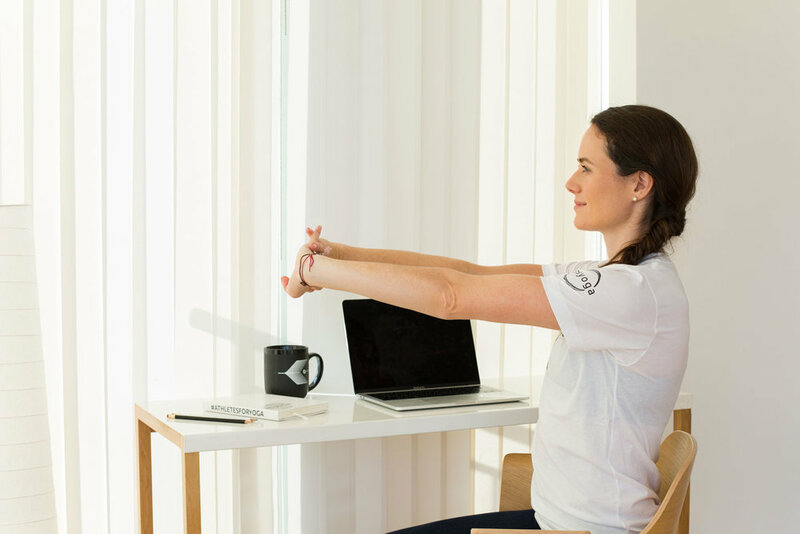 Set a reminder to do this 5-minute routine at least once a day at your desk (or anywhere) to ease the strain of sitting, reduce stress and tension, and help stay more balanced even as you work. Hold each stretch for 5–10 deep breaths and feel the difference in your body (and mind). Sit tall in your chair with your feet on the floor. Interlace your fingers behind you. Squeeze your shoulder blades toward each other and move your elbows closer together while pressing down and back through your knuckles. Switch your interlace and repeat. 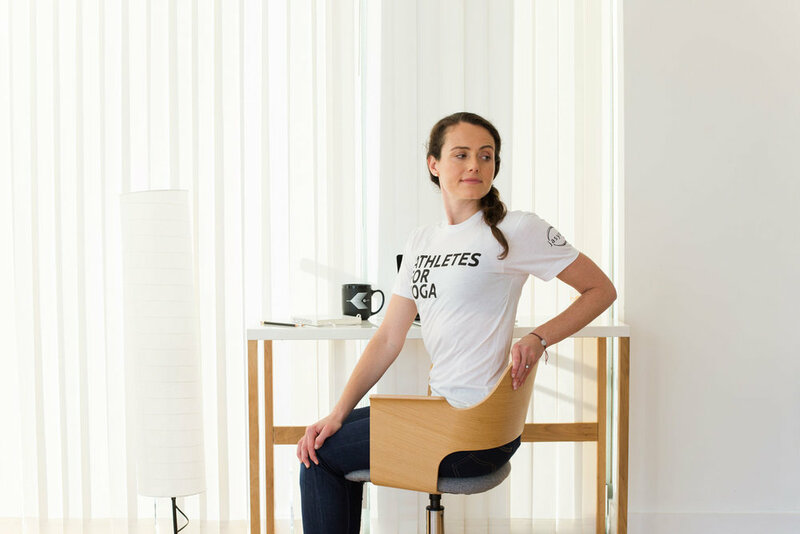 Gently twist to one side by rotating your rib cage on your spine—place one hand on your knee and your other hand to the back of your chair, but don't use your arms to pull yourself deeper into the twist. Look over your back shoulder. Circle your head to one shoulder and pause. Reach out through your arm on the opposite side. Drop your chin back down toward your chest, then rotate it back to the same side (it's like a quarter circle) while you continue to reach through the fingers of your extended arm. Circle 5–10 times, pausing in any spots that feel particularly tense and breathing deeply there. Interlace your fingers and press your palms away from you. Looking for more moves to take your Reset into your real life? Try our 5-Minute Neck Reset, How to Hit Reset Anywhere, Anytime, and Couch Reset videos at video.jasyoga.com. Share your desk Reset and all your real life yoga adventures with #yogaforreal!